The 2015/16 orchestral season at Bradford’s magnificent St George’s Hall, brings together two top international orchestras and two concerts from Britain’s own leading symphony orchestra, The Hallé. “As we embark on the 150th orchestral season at St George’s Hall, we enter a new phase for Bradford’s historic hall. Bradford Council is seeking to undertake a programme of works to maintain and improve the building as one of Bradford’s key heritage venues and cultural attractions, a building which has been an integral part of Bradford’s landscape since 1853. Work continues to prepare for round two of the application process for Heritage Lottery Funding to support this improvement programme. Subject to funding being available, the Hall is scheduled to close temporarily in March 2016 for twelve months to allow these works to be completed. This means unavoidably reducing the number of orchestral concerts in the 2015/16 season. The 2015/16 orchestral season consists of four concerts with performances by Dresden Philharmonic Orchestra, Prague Symphony Orchestra and two concerts performed by our resident orchestra, the Hallé; including of course the very popular New Year Celebration concert. The renowned Dresden Philharmonic Orchestra open the 2015/16 season with their debut at St George’s Hall and they are joined by one of today’s greatest cellists, Sol Gabetta as the soloist for the evening. The evening’s programme includes Wagner’s majestic Meistersinger Overture, Elgar’s beloved and elegiac Cello Concerto and Beethoven’s epic Symphony no. 3 known as the Eroica, the first great work of the Romantic Period. The Prague Symphony Orchestra make a welcome return to St George’s Hall. Their programme starts with Smetana’s dramatic Sarka, followed by Beethoven’s sublime Violin Concerto performed Chloe Hanslip; one of the UK’s the most popular young musicians. The superb Louis Langrée joins piano soloist Alexander Gavrylyuk and the Hallé on Saturday 5 December for an evening of music by Mendelssohn, Schumann and Berlioz. The Hallé return in January 2016 to close the 2015-16 season with the very popular Viennese concert. Take a waltz (and march and polka) around the ballrooms of Vienna as Jamie Phillips and the Hallé celebrate the New Year in traditional style. Swedish soprano Malin Christensson will bring glamour to the occasion with a selection of popular songs and arias. “I am delighted to continue my patronage of the Bradford International Orchestral Concert Season in 2015/16. 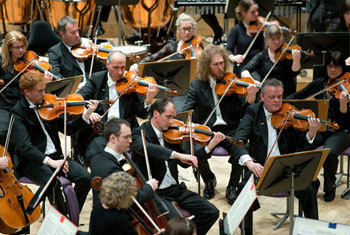 This exciting season brings some world renowned orchestras and international artists to St George’s Hall in Bradford. I am especially pleased to be involved at such an important time in the history of St George’s Hall. It’s a joy to hear that St George’s Hall is being considered for Heritage Lottery Funding so that renovations can be undertaken, preserving the character and of course those golden acoustics I love. Bradford Theatres are proud to present Bradford’s long established chamber music season, now in its 28th year in the beautiful surroundings of Bradford Cathedral. The seven concert series opens on Friday 11 September 2015 with a welcome return from the critically acclaimed pianist Martin Roscoe and closes in April 2016 with a with a very special concert from the European Union Chamber Orchestra with the Bradford Cathedral Choir. Classical music lovers can save 25% with a Legacy subscription, which includes all four orchestral concerts (that’s one concert FREE!). There are chamber subscription packages available too, with savings of up to 20%. New subscriptions go on sale from Monday 22 June and tickets go on general sale on Monday 29 June 2015.